August 28, 2007 - A second hotel is coming to City Centre, sparking optimism it will give the area a much-needed economic boost. Slated for an 8.5-acre parcel of land immediately north of the Living Arts Centre (LAC), the proposed mixed use project is comprised of a 12-storey, 225-room hotel/conference centre and eight condominium towers. As well, the plan calls for live/work and retail units on Duke of York Blvd. Ed Sajecki, the City of Mississauga’s commissioner of building and planning, confirmed an application has been received from World Class Developments Ltd. (WCD), a group headed by Streetsville’s Murray Cook, whose developments stretch from Toronto and Vancouver to Dubai. The development application will be heard Sept. 20 by the City’s Committee of Adjustment. In particular, Sajecki cited the Bus Rapid Transit (BRT) and Light Rapid Transit (LRT) systems, which will have their main hubs in the city core, making the area transit-friendly. “The LAC’s Hammerson Hall and Royal Bank Theatre could also serve as break-out rooms for the new hotel. It’s all coming together,” he observed. Sajecki said the new project is only the second to be looked at by the City’s newly-formed design review panel and he has high hopes for its input. “The project is quite striking from an architectural standpoint. It’s very modernistic and complementary to the LAC,” he said. City Centre has had great success attracting condo developments, and the missing component for sustainable intensification, all agree, is increased business activity. This project will go a long way towards doing that, said Bruce Carr, the City’s director of strategic planning and business service. The project is being shepherded through the process by well-known consultant Barry Lyon, who’s not unfamiliar with the city’s development scene. He consulted on the recently-approved FRAM/Slokker project in Port Credit. Early artist’s sketches show the complex connected to the LAC by an overhead, covered walkway, with a street-level promenade between the two. The hotel will bear the name of a well-known, upscale chain, he added. Sajecki said it could take 10 years for the project to be completed. The hotel is part of phase one. “The project demonstrates the maturity of the Mississauga market. The downtown core is ready for this now,” he said. Wow this sounds amazing. Just what we need in Mississauga. I guess this will be part of the development with the condos in the Northwest parking lot of Square one as well. Eventually that is. As I don't think 8 condos could fit in the space they're talking about. Maybe 5 or 6. An upscale hotel chain will be in it too? Wow. Very impressive. What is your source for this information? Slightly off topic - but here is a photo of MCC taken from Yonge and Eglinton last week. Another step forward for MCC. Looks promising. There would appear to be some attention to an active street level as well. Hopefully ten years won't have to pass before it's completed. Good news. Can't wait to see some renderings. This represents another major step forward in bringing mixed uses to MCC. With any luck some new office space will follow. This is one of the few MCC developments that actually looks promising. Looking forward to seeing it. Finally! This is great news! It's actually a very large site, but since it's currently wooded, it's hard to tell. A new hotel is very welcome - the Novotel is the only option for miles around, and it fills up often. More restaurants is a good thing too ! The render in the Mississauga News looks awesome! Mississauga City Centre a Joke No More! Another major piece in the development of Mississauga City Centre. This is a key site that connects the Civic precinct to the south with the Entertainment District (Coliseum/restaurants/Playdium) to the North along Rathburn Road, to Square One/Transit Terminal to the east and the Daniels/Amacon development to the west. It also reinforces the vision of turning Duke of York Blvd as the "Main Street" in the City Centre. The proposed retail, work/live uses will make that a reality. Also exciting and something to take note of is the establishment of the Design Review Panel for the City Centre. This is just the beginning, a Post-Secondary education campus is being sought after. The city is undertaking a study for a new permanet Market building. Square One has begun construction of the first phase of its "main street" development. Major parcels of lands south of Burnhamthrope Road are still avilable. As for office development in the core, 150 of city's top CEO's will gather next month for the "Mississauga Summit" http://mississaugasummit.ca/modelled after the successful Toronto City Summits, one of the key topics of discussion is the Economic Development of the City Centre. You can bet there will be a strong call and push from the CEO's to move their headquarters and build in the City Centre. Mayor Richard Delay of Chicago is scheduled to be the keynote speaker of the summit. Mississauga's first Aa buildings? Looks rather like the Clewesian motif. OH MY GOD! I wish I had a scanner! 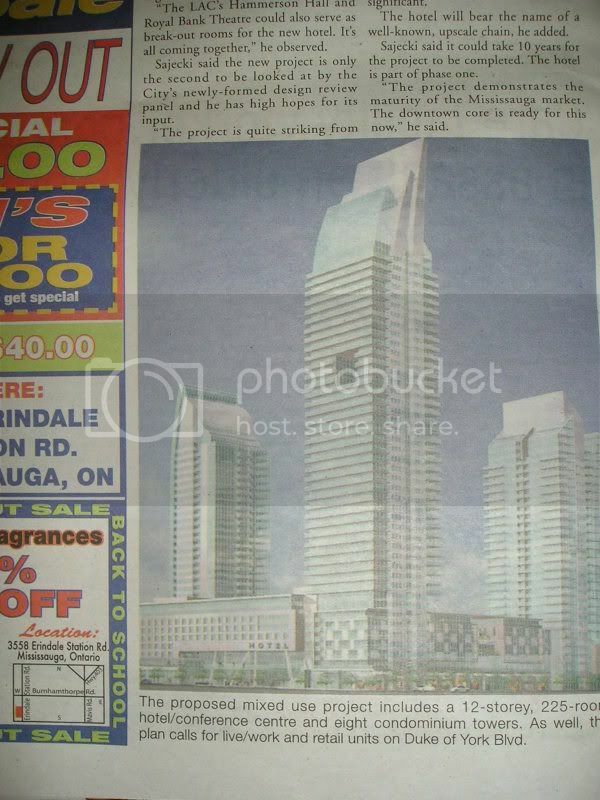 In Today's Mississauga News there was a rendering of the development showing 3 Towers and a hotel. I counted at least 60 storeys on one tower which doesn't include at least another 5 storeys for a glass atrium on top, and to top that all off two massive curved white sails to form a roofline reaching at least another 5 storeys above, which reminds me of the sails of the Sydney Opera House! Did I metion there is a giant square void at least 4 storeys tall in the centre of the tower near the 41 -45th floor! The other 2 towers shown are 32 storeys each. Not shown in the renderings is another 5 more towers! The Hotel is at the base of the tallest tower, reaching 12 storeys tall, shaped as a huge rectangular box, with a 3 storey glass atrium running across the bottom, which appears to have 5-6 OCAD type stilts scatted across and holding up the atrium.